Trump insults police: They’re too scared to fight terrorism. Donald Trump visits the Manchester Police Department during a shift change on Feb. 4 in Manchester, New Hampshire. 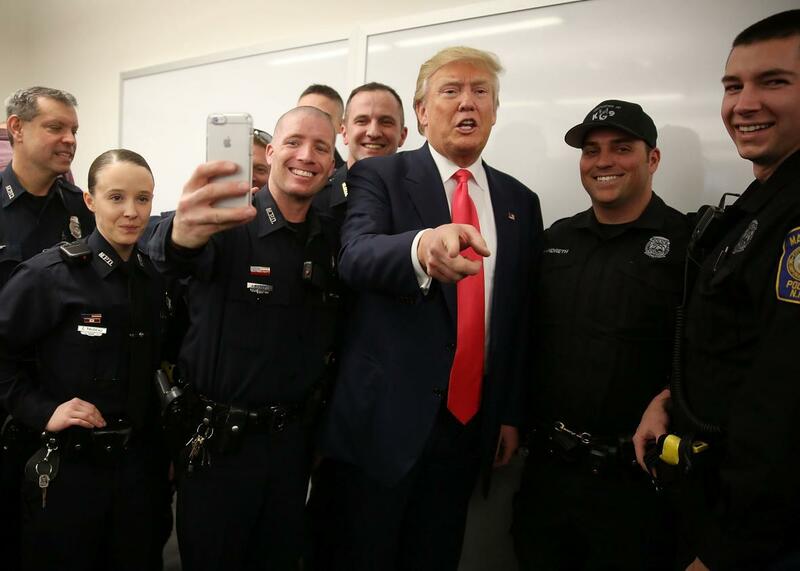 Trump’s intended message—which he telegraphed by calling the police “amazing”—was that the culture of political correctness that has taken root in Obama’s America has made it impossible for cops to be as aggressive as they need to be. Fine. But what he actually said is that police officers are aware of terrorists who are plotting attacks but are declining to pursue them because they’re scared. This is not subtext. It’s literally what he said! The incoherence of saying it right after praising police for being “amazing” reminds me of one of the strangest aspects of the national debate over law enforcement that began with the shooting of Michael Brown: In the course of arguing for the existence of a “Ferguson effect,” pro-police critics of the Black Lives Matter movement have passionately argued that the reason the murder rate in cities like Chicago and Baltimore has skyrocketed is that police in those cities have become too intimidated by activists to properly do their jobs. To me, this has never sounded like anything other than a harsh attack on the professionalism and resilience of police. Oh, also: We do profile. In 2010, the notoriously politically correct Obama administration called for extra scrutiny of people entering the U.S. from 14 mostly Muslim countries, including the Chelsea bomber’s home country of Afghanistan. And earlier this year, the federal government instituted new rules making it harder for people who have visited Iran, Iraq, Sudan, or Syria since 2011 to enter the country. No doubt, Trump would say those measures aren’t strict enough—that our borders are still being undermined by the foolish imperative to not make generalizations about people based on where they come from. Trump would also probably say that no travel rule could ever protect us from terrorists who are already in our midst. Based on his comments on Fox & Friends, it sounds like Trump blames the danger posed by those individuals on our cops. On Friday, the Fraternal Order of Police, the country’s largest police union, endorsed Trump for president. What does the union’s executive director, Jim Pasco, think about Trump’s suggestion that his members are so cowed by liberal bed-wetters that they are allowing known terrorists to operate with impunity? Pasco did not immediately respond to a request for comment. Read more from Slate on the bombings in Manhattan and New Jersey.